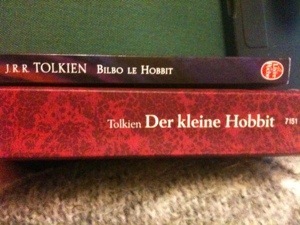 And now, it’s time again for the Tri-lingual Hobbit Re-read! When last we left our intrepid band of short adventurers, they’d managed to escape the goblins only to run smack into a lengthy scene of exposition. This is what Bilbo gets for sneaking up on them all with a magic ring, doncha know. And then OHNOEZ ROCK SLIDE! Picking up again in Chapter 6 of The Hobbit, Gandalf is finishing up cluing in Bilbo on what happened while he was playing at riddles! 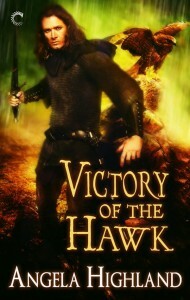 Goodness, a book released today couldn’t get away with so much telling of action that the protagonist happened to miss, I must say! Much argument could be had on either side as to whether this is actually a good thing–but to be sure, it’s in keeping with the more relaxed pace of this story, as well as Tolkien’s overall style. Oh hey, here’s a bit that pings one of my SuperMemo vocabulary verbs: “vous vous le rappeler sans doute”. The actual English text says “as you remember”, and it’s in the bit where the narrator is reminding the reader of Gandalf’s skill with fireworks at the solstice celebrations of the Old Took. Google Translate translates the French phrase as “you probably recall”. And it pinged off of me because I was just this morning reviewing “se rappeler” as a verb, i.e., to remember/recall. The “se” bit changes appropriately to reflect the subject of the sentence, so in this case it’s pinging off of “vous”, the reader. Here’s another good verb: “falloir”. The English text says “it took a wizard to keep his head in the tunnels and guide them in the right direction”. In French, it’s “il fallait un magicien pour garder la tête claire dans les tunnels et les guider dans la bonne direction”. “Fallait” is the conjugation I’m interested in here, because 1) it’s imperfect tense, and 2) falloir is what is apparently called an impersonal verb. So it only gets conjugated in third person, singular, indefinite! I’m going to have to keep an eye out for this one in SuperMemo. I’m sure I’ll see it sooner or later. Ooh, here’s another verb I know from songs–gémit, appearing in this sentence: « Mais j’ai horriblement faim », gémit Bilbo. Gémir means “moan/groan”, and it’s all over the lyrics to the awesome La Volée d’Castors song “Belle embarquez”! I am deeply unsurprised to see this word showing up in the context of Bilbo bitching about how hungry he is! “Une horrible confusion”–this is an instance of how sometimes French words do look pretty much like the English ones, except for being pronounced differently! This post’s most awesome gigantic French word award must go to “s’épaississaient”! Spotted in the phrase “Déjà les ombres s’épaississaient sur elles”, or “Already the shadows were deepening around them” as in the original English. That big ol’ word comes from the verb “épaissir”, and it’s imperfect tense, third person, specifically. I’m slowly getting the hanging of thinking “ongoing action” when it comes to the imperfect tense. This post’s award for Most Awesome Gigantic German word goes to “Mittsommergesellschaften”! “Jetzt müssen wir weiter” is the translation provided in German for Gandalf telling everyone “Let’s get on!” Google Translate claims this comes out to “now we must continue”. I keep thinking from the rhythm of the words that I might have heard something that sounds like this before, maybe a fragment of the (admittedly badly pronounced, but hey) German in Raiders of the Lost Ark. I will have to doublecheck this! Here’s another awesome German word: “Überbleibsel”! It means “remnant” and appears in the context of the party scrambling down the rocks that are a remnant of a landslide. But I swear, it sounds like it ought to be some sort of futuristic flying car or something! This word, on the other hand, looks like it ought to be Japanese: “Tohuwabohu”! It means “chaos”. SWEET. That’s it for this post, but before I go, let me share with you my amusement at the comparative thicknesses of the French and German editions of the book. The French version, as you can see, is a much slimmer volume. The German is of course written in German, so naturally one could joke about all the words being longer–but more relevant is that the German text is in a significantly larger point size! Here’s a photo to show you the difference in book thickness! Next time: dwarves and a hobbit! In trees! That are on FIRE! ETA 10/2/2012: A few German speakers have advised me that ‘Tohuwabohu’ is in common enough use in the German language that they don’t think of it as anything but a German word. So it looks like it must have become a loan word, jumping from Hebrew over to German. Learning about this kind of thing, folks, is exactly why I’m enjoying going through the translated versions of The Hobbit so much! Vielen Dank to the German speakers who have enlightened me! Moving into Chapter 6 of The Hobbit, we find our hero Mr. Baggins/M. Baggins/Herr Beutlin emerging out of the Misty Mountains–with a magic ring on! Also, as an epilogue to the previous chapter, I must note that German!Gollum using “mein Schatz” for “my precious” is deeply giggle-inducing for me given that I associate that phrase with an Elvis Presley song. Now I have an entirely different spin on the bridge of “Wooden Heart”, imagining it sung by Andy Serkis. Hi folks, welcome to my brain! I gotta admit, if I were Bilbo, travelling with a bunch of dwarves who’d up to this chapter found me fairly useless, I’d TOTALLY be planning to surprise them with my new shiny magic ring, too. Red hood! Hi there, Balin! Not your fault that the tricksy hobbit could sneak past you when you’re on watch. “You nearly chopped off my head with Glamdring, and Thorin was stabbing here there and everywhere with Orcrist.” This, of course, requires a macro saying DORI IS UNIMPRESSED BY YOUR SWORDS OF GONDOLIN. Ranting!Dori is, however, COMPLETELY AND UTTERLY PWNED by Bilbo going OH HAI in the first recorded incident in Middle-Earth of a hobbit pwning thirteen dwarves and a wizard all at the same time. The English title of this chapter is “Out of the Frying-Pan into the Fire”, but in the French edition, it’s “De Charybde en Scylla”–which is of course referring to Scylla and Charybdis. It intrigues me that the French translator jumped over to this phrase; one presumes that “out of the frying-pan into the fire” otherwise doesn’t translate. Since beginning this re-read I’ve started working on my French vocabulary using an app called SuperMemo on my iPhone, and because of that app, I picked up a couple of words that I was tickled to recognize in the very first paragraph of the French edition: “ensuite” and “avant”. I still need to work on my comprehension of these words, though, because I thought they meant “after” and “before”–but the sentence they appear in starts “Il regarde ensuite en avant…”, and this is the analogue of the sentence in the English edition where it says “Then he looked forward…” Note to self: keep this in mind in SuperMemo vocabulary review tomorrow! I understood pretty much this entire line of Bilbo’s: “J’espère seulement, pour l’amour de Dieu, qu’ils ne sont plus là-bas au pouvoir les gobelins !” (Bilbo saying he hopes for the love of God that they, i.e., Gandalf and the dwarves, are not still back there in the power of the goblins.) Of particular note here: I picked up “seulement” and “pouvoir” as SuperMemo vocab words, and I recognized “là-bas” out of the lyrics of the Le Vent du Nord song “Rossignolet”! Recognizing a few more SuperMemo vocabulary words as I go, too–“niveau” (level, as in “the level of the path”), “se développait” (conjugation of the verb “se développer”, develop), “retourner” (return), and more. So clearly, working with this app is improving my vocabulary quite a bit! I’m finding the text rather easier to follow than the last time I did this! Wait, what, did the French translator sneak an Italian phrase in here? Here’s the sentence: “En vérité, Bilbo était si content de leurs compliments qu’il se contenta de rire in petto, sans rire dire de l’anneau”. The italics are the translator’s, and Google Translate thinks “in petto” is indeed Italian, meaning roughly “in his chest”. Interesting! A friend on Twitter points me at this reference for that phrase, which makes a lot more sense when you think about it being used in a Catholic country. And oh, this is weird! After Bilbo tells his story to the dwarves, completely leaving out the part about finding the Ring, he asks Gandalf what he’d been doing all this time. The original English says, “The wizard, to tell the truth, never minded explaining his cleverness more than once”. But in the French, it says “A vrai dire, le magicien n’aimait pas expliquer plus d’une fois ses artifices”. Which, if I’m reading this correctly, says pretty much the exact opposite of what the English edition says. Francophones, I am reading this correctly, aren’t I? In contrast to the chapter title in the French edition, the German edition’s title is pretty much a direct translation of the English: “Raus aus der Bratpfanne, rein ins Feuer”. Except, however, for that little word “rein” in there, which Google Translate is telling me has a few different possible meanings. “Pure”, “clean”, and “straight” are all proposed, so I’m guessing this is intended to be “Out of the frying-pan straight into the fire”. I note with satisfaction that the German word for coat here, “Mantel”, is very close to the French “manteau”. Huh, in the first paragraph of the chapter, the narrative describes how the sun goes down in the west, and both the English and French editions italicize “behind the mountains”. The German edition does not! Bit of a difference as well where the English edition says of Bilbo that “He wandered on and on”, and the German says “Er marschierte und marschierte” (he marched and marched). Herr Beutlin thus strikes me as a tad more self-possessed than Mister Baggins, hmm? Oh cool, how awesome an interjection is “Donnerwetter”? In English, Bilbo says “Good heavens”! Google Translate claims “Donnerwetter” means gosh, damn, or heavens! Literally, I think it’s “thunder weather”, but way to be inspecific on the translation there, Google! Any German speakers want to chime in on the best translation for this? Here also, for reference, is the German version of the French sentence I understood above: “Ich kann nur hoffen, dass sie sich nicht mehr dahinten in den Klauen der Orks befinden!” Slight difference of translation here as “Klauen” appears to be “clutches”. Oh bah, German translator, was it really necessary for you to rearrange paragraph breaks? Especially given that you’re not signifying Bilbo’s thoughts either by italics OR by quotes? I totally lost track of where Bilbo tells himself “I will give them all a surprise”, and had to dig through a long paragraph to find it. It rendered in German as “Die werden ganz schön überrascht sein, dachte er”. Dori snarking on Gandalf and Thorin stabbing everything in sight reads pretty awesomely in German: “Beinahe hättet Ihr meinen Kopf mit Glamdring abgehauen und Thorin stach hier und dort und überall mit Orkrist herum.” German!Dori is ALSO unimpressed by your swords of Gondolin! Here’s a fun German word: “Massenweise”! This is what Bilbo says when the dwarves are all “BUT BUT BUT weren’t there guards? !” Google Translate says this is essentially “lots” or “tons” or “masses of ’em”! For interesting contrast to the weirdly translated French sentence above, here’s the German equivalent: “Dem Zauberer, um die Wahrheit zu sagen, kam es durchaus nicht ungelegen, seine Gescheitheit noch einmal zu beweisen.” Looks like German!Gandalf, like his English counterpart, is quite happy to go on about how why YES, he IS awesome, why do you ask? And this’ll do me for tonight, I think! Next time: more of our merry company catching up with each other before things start getting difficult again!